Version 1.13 is now online. I have edited the Gold Ingot to Coins to 75 coins and it will take 110 coins to make a gold ingot. In theory you will loose some of the material when smelting it down and some will be lost during the crafting of the coins. 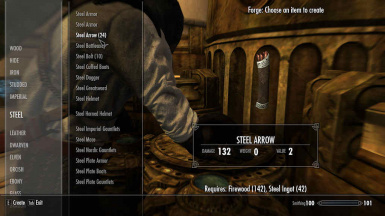 Added the ability to craft the Wolf Armor from the Companions Guild after you complete the "Proving Honor" quest. It can only be crafted at the Skyforge. Added Silver Arrows - Very good against the undead. Added the breakdown of several sets of clothing to Linen. And added crafting of the Fine clothing and footwear at Tanning Rack. 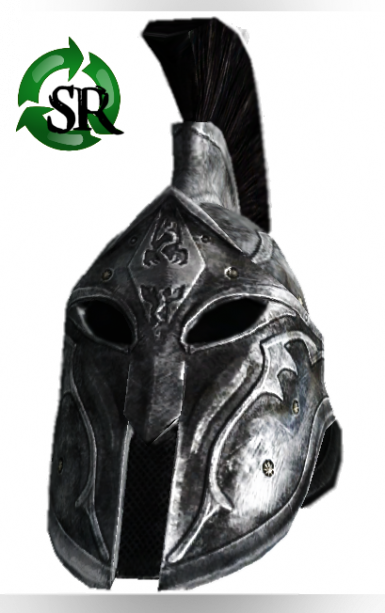 Removed Perk requirements for ebony, dwarven, glass, Orcish, dragon, elven, Stahlrim and replaced with Advanced Armors perk only. If you are using a Perk changing mod you may need to add this Vanilla Perk manually via the console. There is also a NO PERKS version as well under the optional downloads. 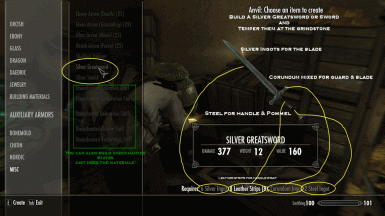 Although not immersive, this will allow players to use mods such as Ordinator - Perks of Skyrim. Added ability to check to see if item is equipped (no favorite). If armor or weapon is equipped then it will not show up to be recycled. If unequiped then it will show up even if tempered or enchanted. This means if your favorite weapon and armor that has been tempered and enchanted and YOU ARE wearing it when you start smelting it shouldn't show up! i.e. 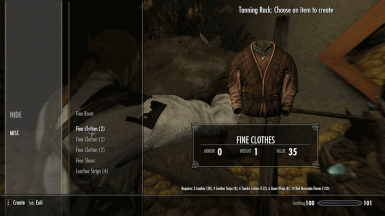 If your wearing elven armor full set and have several pieces extra in inventory then those NOT equipped will show to be recycled. I am curious how this compares to Val's, as that is the one I currently use. Is this one more thorough? I like the idea of this mod, but, I don't like that it will recycle my favorited items i.e. stuff like the shield I am currently not using because my bow is currently being used or vice-a-versa, or my arrows that I just had equipped until I equipped my sword. 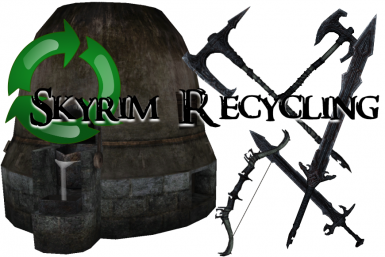 This mod would be so much better if you had a way to protect items you don't want to recycle by accident. I find I have to be really careful at the smelter now so I don't accidently recyle items I want to keep. I also don't like that it will recycle magic items, as these are usually worth a lot more than the ingots you will get recycling. On the positive side I do like the other aspects of the mod. However unless there is an update addressing the favorited and magic items i will not use it in the future. What is the point of the Ingot-Shaped Glass that you can make from smelting Empty Glass Bottles? There doesn't seem to be anything you can do with them. Perhaps to support Hearthfire home construction which requires glass for various home decorations and other clutter. That would be redundant because you can also smelt Empty Glass Bottles directly into Hearthfire Glass. Hey does anyone know if this mod works well with Ars Metallica? I'm playing a thief character who would love to have his stolen items melted down, but would have no idea how to do it, nor the inclination to learn. Could an NPC be added that would do this? Kind of a chop-shop for Skyrim? I know zero about modding, so I don't know if this is possible or how hard it would be, but thought I'd throw it out there. The normal fence works just fine, so no big deal if not. Why did you include unique items, like Merhunes Razor and the Mask of Clavicus Vile? 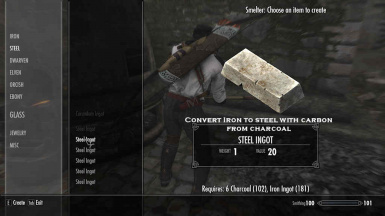 Do you know anyone so desperate for Ebony that they would scrap one-of-a-kind items just to get a few ignots? 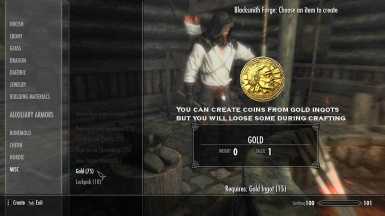 Sure, there might be a handful of people who would, but they might as well sell the unique items for gold, then buy some ingots from a smith. 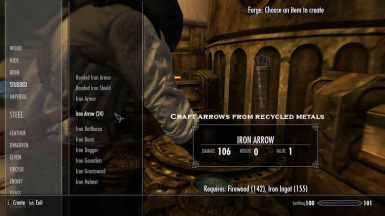 As it is, making unique items scrappable is an invitation for one to have "an unfortunate smelting accident." I think putting a Daedric artifact into a forge may result in the forge violently exploding. this cant be intentional, but is it? getting an eyeball from jewelry? Iron, Steel, FireWood, charcoal - x5 / x10 / x25 /x50/ x100 please !! You’re awesome for doing this. I think making the junk items useful was one of the biggest quality-of-life improvements Bethesda made to their games, and I hope they don’t limit it to the Fallout series.